With another heavy Alberta winter of snow and ice already upon us, Fine Line Homes would like to remind you of energy-efficiency measures you can use to reduce heating costs and resource consumption during the year’s coldest months. As one of the leading custom home builders in Calgary, Fine Line Homes is proud to employ these and many other energy-saving features and strategies in all the homes we build. Structural insulated panels (SIPs) are one of our most popular insulation products, and they deliver excellent savings year in and year out. In addition to crafting an airtight building envelope on every home we build, we also recommend the use of structural insulated panels in both your wall and roof systems. The potential for savings is remarkable: structural insulated panels offer as much as 30 per cent more thermal resistance than standard insulation, making your home up to four times more airtight. The bottom line is that they could save you as much as 50 per cent on your home heating and cooling costs, as they keep warm air inside during the winter and resist hot outdoor air during the summer. Water consumption is another major operational expense, particularly in the winter when demand for hot water is higher. At Fine Line Homes, we employ a range of water conservation and energy-saving strategies which can help you reduce consumption and costs by as much as 40 per cent. EnerGuide ratings of 0 to 64 indicate that the home does not meet any current standards of energy efficiency. 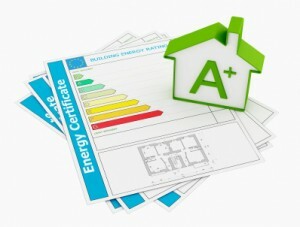 Ratings between 65 and 72 mean the home meets minimum energy efficiency requirements. Ratings between 73 and 79 indicate the home exceeds minimum requirements, but still has a lot of room for improvement. Ratings between 80 and 90 mean the home is exceptionally energy-efficient. Ratings from 91 to 100 indicate the house is optimized for maximum energy efficiency. At Fine Line Homes, all our custom builds have a minimum EnerGuide rating of 80, and we offer a wide range of upgrades and performance features that can boost your home’s energy efficiency into the top rating tier for a very affordable price. Remember: the more energy-efficient your home is, the greater your annual cost savings will be. High-efficiency homes also enjoy significantly higher resale values than comparable homes that lack the same energy-saving features. The bottom line is this: energy efficiency is always a very wise investment. Another advantage of building an energy-efficient custom home is that you can qualify for significant discounts on your mortgage loan. The Canada Mortgage and Housing Corporation (CMHC) and Genworth Canada both participate in a program that makes discounted mortgages available to home buyers purchasing properties with energy efficiency features. If you’re purchasing a home with an EnerGuide rating of 82 or higher, both the CMHC and Genworth Canada will offer you a 10 per cent discount on your mortgage insurance. This can translate into hundreds of dollars in instant savings, while giving you access to a wide range of popular household products and discounted rates. At Fine Line Homes, we work closely with each individual client to ensure their lifestyle dreams are met for a price they can afford. In addition to offering a comprehensive range of state-of-the-art energy efficiency technologies, we also provide each client with an endless array of customization options. Choose the layout, floor plan and in-home features you’ve always wanted for prices that compare against what you would pay for a standard build. Visit us online to learn more about our mission and principles, or to receive further information about our homes and building processes.